In this case, the 1-year-old was "The Weekly Herald" which had been born 12 months earlier as "The Hampstead Herald." In the anniversary issue of April 3-9, 1990, my co-publisher Wesley Goldstein talked humorously about how he traded in his sports reporter’s notepad for his new executive role with "The Weekly Herald," a transition which could have been the basis of a movie or at least a sit-com. After "The Weekly Herald" folded, Wesley went back to his first love — sports journalism —successfully plying his trade with CBSSports.com where he gets to indulge his passion for the National Hockley League while living with his wife and daughter in balmy South Florida. In the same Year 1 anniversary issue, I opined about the importance of a democratic society safeguarding its freedoms by encouraging divergent journalistic voices to offset the sometimes symbiotic, cozy relationships among large media companies, multinational corporations and governments with self-serving agendas. In French, there is a saying, Plus ça change, plus ça reste pareille, meaning, The more things change, the more they stay the same. Almost two decades since I wrote that anniversary piece, I only have to substitute “internet” for “community newspapers” to conjure up renewed hope for the future of independent journalism. The Weekly Herald turns 1! 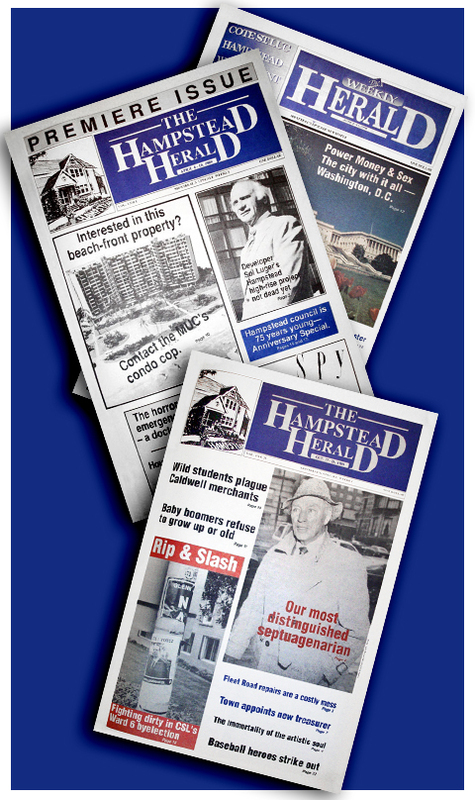 The April 3rd, 1990, issue of The Weekly Herald marks a special occasion for me, my co-publisher and partner, Wesley Goldstein, and our dedicated staff — it's the first anniversary of our weekly newspaper, which began arriving at readers' doors on April 4, 1989. This living product, made up of the contributions of so many people — writers, editors, graphic artists, illustrators, photographers, sales consultants, managers, operators, supportive family and friends, accountants, lawyers, bankers, and, most importantly, appreciative readers and advertisers — was born of a dream and a vision that Wesley and I shared. In Roman mythology, Birth is also known as the god of Genius — that spirit of higher self which presides over the birth of every person and attends him or her throughout life. It's the same spirit which makes a being human; the same instinct which tells a man or a woman that there is more to life than the material sustenance needed to survive. There is a higher calling for each and every one of us. But it can only be attained by reaching out and giving of ourselves in an effort to awaken the beauty and talent in others who may have lost their way or who lack the confidence and training to fulfill their potential. How do such high-flown paeans to the human spirit fit in with the first birthday party of a weekly newspaper which is delivered door to door every week to homes in Cote St. Luc, Hampstead, Westmount and the Town of Mount Royal? Well, our first year in business has opened our eyes and probably those of many of our readers to the incredible energy and talents of our friends and neighbors who work for and contribute to this newspaper. We have provided a forum for intellectuals and writers such as columnist Mel Solman, Dr. Todd McConnell, accountant David Wilkenfeld, English professor Linda Shohet, Dr. Marcel Tenenbaum, Prof. Margot Somerville, Dr. Augustin Roy, Cara MacNaughton, Mark and Sami Teitelbaum, Celine Miigdal, as well as lawyers Peter Blaikie, George Peizler and Larry Moroz. Other well-known, local writers such as Lolly Golt, Stan Shatenstein, Arrnold Bennett and E.J. Gordon have also chosen to join us. Of course, our small staff of journalists, our photo edlitor and our graphics department personnel have performed minor miracles in producing such a professional-looking publication week in and week out. Having been a working journalist for 18 years at some major media companies, I have had occasion over the years to read many publications from around the world with a critical eye as to their form and content. The Weekly Herald was intended to be a first-rate publication. Wesley and I wanted our readers, many of whom travel extensively, to feel as though their weekly was in a class of its own. Judging by the many favorable comments we have received in our first year, the paper has hit the mark in that regard. It has also served to draw together elements of the four communities we serve — it has made readers aware of what is going on not only in their community, but in the neighboring municipalities, with which they have so much in common. Most importantly, it has set higher standards of ethics, professionalism and content than is normally expected of weekly publications in an effort to better serve the interests of its readers. One anecdote will suffice to illustrate this point. About a month after we started publication last year, we received a phone call from a big potential advertiser, who told us he planned to run several full-page ads with us, but only if we did a story on his firm. Our answer was: "No dice." Our general news coverage is not tied to advertising. In other words, if a subject merits a story, we will gladly do it, regardless of whether the person in question is an advertiser. On the other hand, if a story is not — in our opinion — merited, we won't do one, no matter how big an advertiser the person could turn out to be. That is our commitment to our readers that, unlike other weeklies which trade ads for stories, we will only run articles which we feel will be of interest or relevance to them. Ultimately, we feel that our newspaper will succeed if we put our readers' needs first. So far, our experience has told us that we are on the right track. In discussing the importance of having another editorial voice in English Montreal, we might heed the words of MIT linguist Noam Chomsky, who in his most recent book, Manufacturing Consent: The Political Economy of the Mass Media, discusses the role of propaganda in a democracy. In speaking of major media, this is what Chomsky had to say in an interview two years ago with Bill Moyers: "They're just like any other business. They have a product and a market....Fundamentally, the media are major corporations selling relatively privileged audiences to other businesses, so it's not very surprising to discover that those are the interests they reflect. The managers and editors are very privileged themselves. There's a close interaction and a flow of people between corporate boardrooms, government decision-making centers and media." The point is that our democratic values and free way of life require respect, discipline and nurturing. One of the safeguards in maintaining true democracy is to guard our freedom of expression and thought vigilantly. A vigorous, divergent and independent press is one of the ways we can assure adequate dissemination of ideas and thought-provoking debate of important issues and principles. The Weekly Herald, the only community newspaper in the Montreal area owned and operated by career journalists, has committed itself to providing such an objective forum where issues of the day can be openly discussed with a view to drawing the active participation and input of as many community residents as possible. We thank you for your support and encouragement in Year 1, and we look forward to trying to live up to the great expectations that many of you have imparted to us as you anticipate our second year of life. Certain things become forever etched in one's mind. For me, the time my eventual partner Warren Perley first approached me with the idea of starting a community-oriented weekly newspaper falls into that category. We hadn't seen each other for quite some time, and after exchanging some quick pleasantries, Warren suddenly blurted out: "Wanna start a weekly paper in Hampstead?" My only response was: "Uh, let's talk about it." Little did I know what I was getting myself into. After all, I was perfectly content working for The Canadian Press. Yet I was intrigued enough by Warren's suggestion to at least sit down and talk. So we did. The next day, and the day after, and the day after that. In fact, we're still talking about it, sometimes in disbelief, sometimes in frustration and almost always in awe of where we've come from and what we've gone through to reach the first anniversary of The Hampstead Herald's initial publication. In retrospect, it would make a good movie because the things we've gone through only happen there. Or at the very least a sit-com series. You could call it The Publishers, the story of how two self-described schleppers make good on a dream with little more than a wing, a prayer and penchant for overwork. The series would continue with the same two providing other services for their staff, such as writing their letters, taking their messages and even delivering their packages. In between, you'd see an episode where the pair would be moving the furniture, washing down the floors and carrying out the mail. And everything would be accurate reflections of reality. Part of that reality is that it never ceases to amaze us just how quickly the time has gone and, in contrast, how long the days have seemed. A blur would be an appropriate description. From the time we tossed around ideas for the paper to the time we produced a prototype, tested the market, searched for the equipment, found a location and hired a staff, we have lived in something of a daze. There have been many aspects of this operation that even the 27 years of combined experience we had with major news organizations didn't prepare us for. Some we've learned, some we continue to learn. Putting together the paper actually was the easiest part. In fact, it has continued to be. As a result, and not surprisingly, there were many people who thought we wouldn't get here, and others who probably hoped we wouldn't. Logically, we too should have wondered whether we'd get to celebrate a first anniversary. But then, if we had approached our situation logically, we probably would not have launched an English-language community newspaper — given the economic and political circumstances of the day in Quebec. But we did, and one year later we feel entitled to take a nostalgic look back. We have had a great number of individuals pass through our doors, some whom have stayed, some whom have gone, but all whom have left some kind of impression. And we have had some memorable moments. The night we took our first paste-ups to the printer and watched the process of turning them into a newspaper with the pride of a father in a delivery room seems like only yesterday. So does the day after, when, with about 25 friends and family members, we ordered a dozen large pizzas and a few cases of beer and spent nearly 12 hours putting the newspapers into plastic bags for delivery. It was a process, for a variety of reasons, we discontinued shortly afterward. One thing we did not discontinue, though, was our commitment to producing the finest quality weekly newspaper in terms of editorial content, graphic design and style. In fact, we have done our best to expand that commitment, by opening up our pages to a growing number of contributors and by extending our coverage to include municipal news from Cote St. Luc, Westmount and the Town of Mount Royal. Our name change in January to The Weekly Herald reflects that commitment. And as we begin our second year of publication with a larger staff and better facilities, we are re-dedicating ourselves to the goal of providing the communities and the advertisers we serve with the excellence they have come to expect. And to become forever etched in their minds.